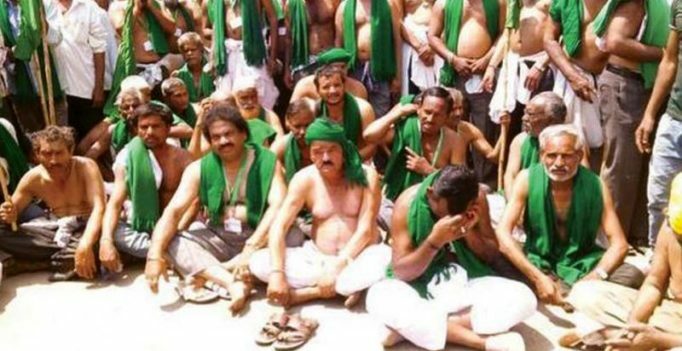 A file photo of Mahadayi farmers protesting in Nargund. Hubballi: With the Mahadayi Water Disputes Tribunal expected to give its final verdict on August 20, farmers in the state plan to begin a dharna at the Freedom Park in Bengaluru from Saturday demanding Karnataka’s share of water. Over a 100 farmers from Nargund and Navalgund have left Hubballi by train to take part in the demonstration. Freedom fighter, H S Doreswamy will be a part of it on the first day of the protest as a show of solidarity. Raitha Sene president, Veeresh Sobaradmath, said the dharna would be held until the day of the tribunal’s verdict. “Our protest will continue in Nargund and Bengaluru until we get our share of Mahadayi water. Our future strategy will be discussed after studying the verdict. We are confident the tribunal will act in favour of Karnataka,” he added. Meanwhile, the Mahadayi Neerigagi Mahavedike (the Forum for Mahadayi Water) comprising of various organisations, has decided to be cautious in its reaction to the tribunal’s verdict. At a meeting of the Mahavedike convened in Dharwad on Friday, farmers resolved to greet the tribunal verdict peacefully. While they were confident it would go in favour of Karnataka, they said they would remain peaceful even otherwise. “ If the verdict is not favourable to us, instead of launching a violent agitation, we will hold peaceful protests and take legal action,” the members said. President of the Mahavedike, Shankar Ambali said it was important to handle the issue delicately. “There is no point in continuing to blame the state and Union governments and elected representatives and resorting to violent agitation. By doing so we are unnecessarily complicating the matter,” he added.